Product prices and availability are accurate as of 2019-04-23 21:39:28 EDT and are subject to change. Any price and availability information displayed on http://www.amazon.com/ at the time of purchase will apply to the purchase of this product. The Glide Splice Swimsuit features a wide strap, Super V-back design, for increased suit coverage and support. Featuring 100% Polyester Endurotech fabriaction, this women's swimsuit offers long lasting durability and maximized resistance to chlorine. 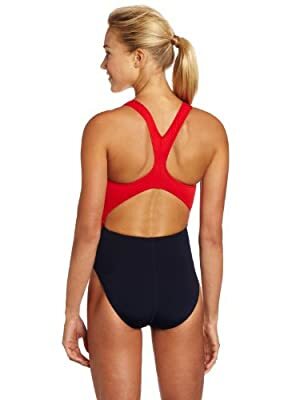 Designed for competition, the Glide Splice Swimsuit maintains it's shape swim after swim, while a close fit helps to reduce bulk and resistance in the water. An ideal choice for swim teams, clubs and competitive swimmers who want an edge. 53% Polyester/47% PBT.